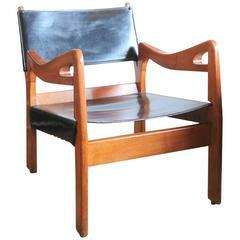 Robert Guillerme & Jacques Chambron armchair. Upholstered armchair with an oak frame. Pair of bridge armchairs designed by Guillerme and Chambron, solid oak structure and newly reupholstered cushions in beige or yellow Jacquard silk fabric, France, 1950s.